Where Do Most Screen Door Designs and Hardware Fall Short? Have you ever tried to buy a screen door that didn't have just the standard black handle, no matter what color the door was? Were you frustrated that you could get a custom screen door, but still had to settle for a black, or if you were lucky, a white color for your decorative screen door hardware? 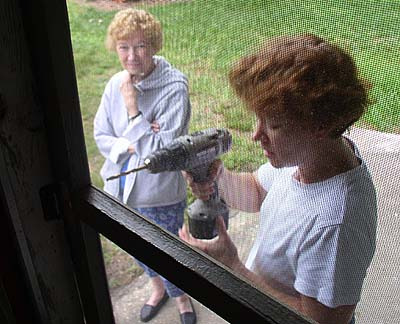 Screen door design should also mean that the hardware for your screen door is easy to use. Have you ever had to help (or be helped) opening those rigid push-button style screen door handles because you have difficulty either due to arthritis or injury? Do you also find yourself replacing those handles every few years because they rust, or the button doesn't line up so you have to try 2 or 3 times to get it to open? And of course that always happens when your hands are full! Why Do So Many Settle for Limited Screen Door Hardware and Design Options? You can have your custom screen door design and matching hardware too! With powder coat finishing, your screen door hardware can be made to match the color of the new screen door. You have more screen door design options then just black or white. In fact you can have up to 5 color options for both your screen door and hardware! And why replace handles every other year and fight to open them most of the time? With a comfortable pull style screen door handle it is easier to open your screen door if you have arthritis trouble, or just a hand full of stuff. The answer is false. If every door that goes goes into your inventory has all the components from installation to hardware in one box, with one skew, then you just saved yourself a lot of time and money in inventory space and management. If you are a contractor, you know the frustration of only being able to offer a customer a white screen door, and being stuck with a black handle that does not match. Now imagine this horrible situation: You are out some distance on a job site, and you go to install the screen door - and you have forgot the handle and all the hardware! If only all those important pieces were packaged together with the door. You have enough on your mind to remember! As a supplier of building materials, you know that you have enough sku numbers to handle and keeping your lists simple is a priority. You may have to manage the inventory of the handles, closure tubes, hinges, and bug sweeps all separately, sometimes all from different sources or suppliers. If the answer for you is true, you can reduce your inventory management, lower your number of product call-backs and offer a better quality product. Check out the PCA for Professionals page to learn more. What Can You Do As A Homeowner Who Just Wants to Buy a Screen Door? Can I get screen door hardware that matches the screen door? Is the hardware also rust-free on the aluminum screen door? Is the screen door and hardware powder finished? Is there more then 1 or 2 color options for the screen door hardware? Does the screen door have security hardware and locks? If the answer is no, and these are important to you, then check our Find a PCA Professionals page and request a professional in your area that can help.